This product is designed to handle wide variety of packaging needs. It is made from virgin and linear low density polyethylene and is heat sealable. The bags come in dispenser packs of 100 for cleanliness and convenience (in 15" wide and under). 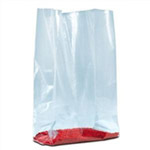 Bags are bottom sealed for extra strength with no side or slit seals. The material meets FDA requirements for use in food applications.